When you think about catering food in an, one of the first elements that comes to mind are trays, presenting delicious appetizers, desserts, entrees, and much more. You must impress the guests by making an impeccable impression, but also, by making cleanup quick and easy for your staff and you. 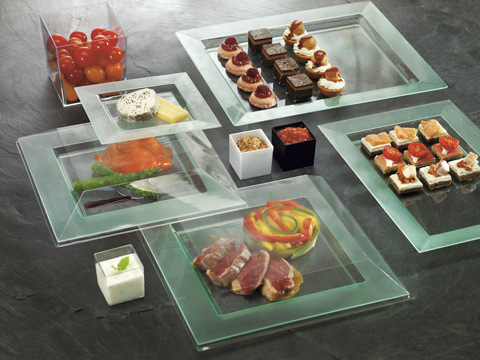 Have both with our exceptional line of disposable plastic plates and trays, perfect for cocktail parties, receptions, and events. Our collection regroups sophisticated and practical disposable plates and trays, that can also be useful for takeout restaurant, catering businesses, hotel restaurants; the possibilities are endless. Disposable Baroque style plates, disposable rectangular trays for appetizers, thermoformed alpha-box for takeout, disposable tray slates, eco-friendly sugarcane bowl, there are but a few examples of what you can offer your guests. Each disposable plate and tray is made to be heat-resistant, durable, and 100 % reusable and compostable. Get your disposable plastic plates and trays at an affordable price with our wholesale prices. If you have questions about our catering plastic plates and trays, or if your need more information about our services and prices, we invite you to contact us. Buy your catering supplies online and get free shipping everywhere in the United States with every $500 orders.